The Phantom II was developed initially as a twin-engined two-seat long-range all-weather attack fighter for service with the US Navy. A letter of intent to order two prototypes was issued 18 October 1954, at which time the aircraft was designated AH-1. The designation was changed to F4H-1 26 May 1955, with change of mission to missile fighter, and the prototype XF4H-1 flew for the first time 27 May 1958. The first production Phantom II was delivered to US Navy Squadron VF-101 in December 1960. 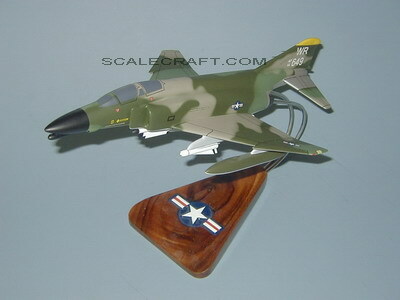 Trials in a ground attack role led to USAF orders, and the basic USN and USAF versions became the F-4 Phantom B and F-4 Phantom C respectively. Mahogany Wood. Scale: 1/48. Wingspan 10 inches, Length 15 1/2 inches.